Michele - or in Venetian parlance Michiel - Marieschi, Venetian veduta painter. 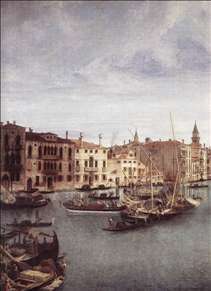 He is much less well known to the public at large than his famous contemporaries Canaletto and Guardi. On the one hand this has to do with the fact that the painter died as a young man, on the other that knowledge of his work is still rather limited. In his best work Marieschi proved himself to be an artist with a style all his own, generally characterized by dark tones and loose brushwork. Michele Marieschi was the son of an engraver, who, according to the sole biography of the painter, was also his only teacher. More recently it has been suggested that he studied with the history painter Gaspare Diziani, a follower of the better-known Sebastiano Ricci. It is not clear whether Marieschi actually visited Germany in his youth, as the biography just mentioned would have us believe. It would appear that Marieschi s career started as that of Canaletto had, since he was involved in making decorations for a feastday and a funeral in 1731 and 1735 respectively. 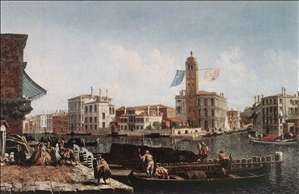 Between 1735 and 1741 he was registered in the Fraglia de Pittori, the guild of painters. Before that time not one of his paintings can be dated with certainty. A series of smoothly painted capriccios in subdued colours is generally considered Marieschi s earliest work. 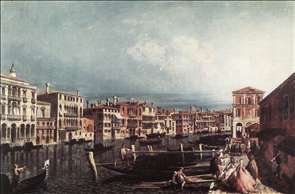 In these paintings, which are mostly small, the influence of Marco Ricci, Carlevaris and Canaletto is evident. 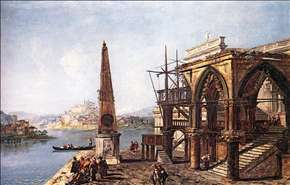 The small works depict ancient ruins beside structures with gothic or Renaissance characteristics, situated in landscapes strongly reminiscent of the Venetian Lagoon. Only in the second instance did Marieschi turn his hand to vedute, possibly in the early 1730s. 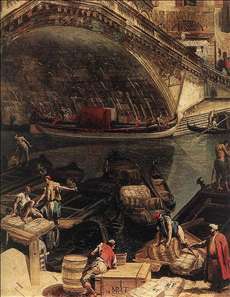 In about 1740 town views eclipsed the capriccios in his oeuvre. One of Marieschi s most important patrons was Field Marshal Matthias von der Schulenburg. In the inventories of his substantial art collection no less than twelve works by the painter are mentioned. Surviving account books indicate that Marieschi worked for the Field Marshal between 1736 and 1738. 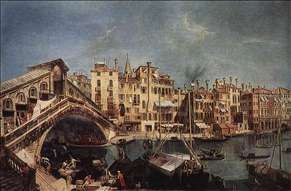 One work he probably commissioned is the view of the Rialto Bridge with the entry of the Patriarch from 1736, which resembles the Rialto Bridge Seen from the Riva del Vin stylistically. In the last phase of Marieschi s career the artist s style becomes clearer and his handling of details more precise. 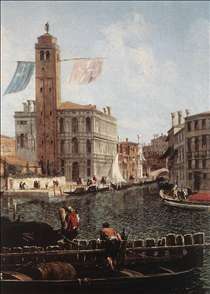 Though the influence of Canaletto s work of the 1730s undoubtedly had something to do with this, it is nonetheless remarkable that Marieschi let himself be influenced by the style but rarely by the compositions of his models. 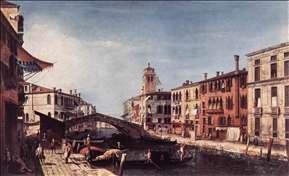 In the Grand Canal near the Salute and the Rialto Bridge Seen from the Riva del Vin, for instance, which are two of his finest works, Marieschi s broad perspective is noticeable. His two wide vedute from the collection of the Earl of Malmesbury in Basingstoke, which date from the 1740s, are also masterly; here the brushwork is even tighter. 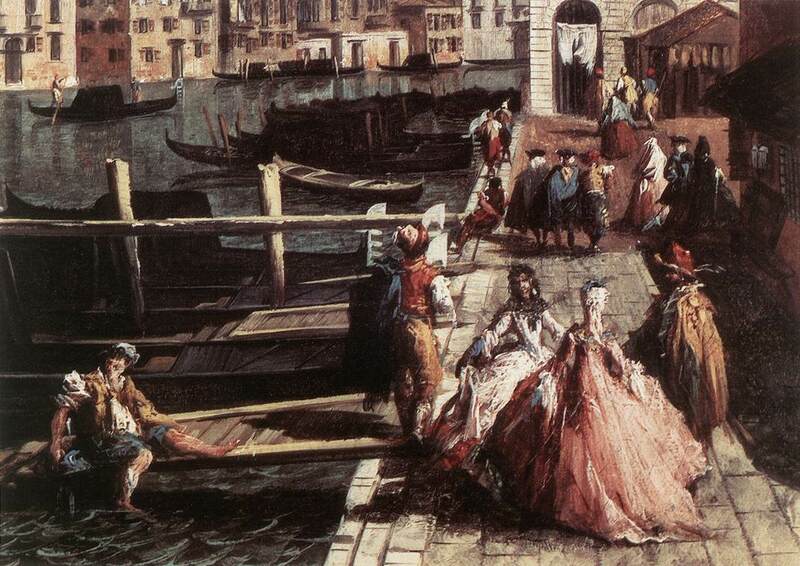 Some authors have recognized the hand of other painters in the figures enlivening several of Marieschi s works, especially that of Gianantonio Guardi. Figures were, of course, sometimes painted by other hands, but in the case of Marieschi this hypothesis seems implausible on stylistic grounds. One work securely attributable to Marieschi is the splendid series of twenty-one etchings published in Venice under the title Magnificentiiores Selectioresque Venetiarum Prospectus in 1742. The prints are distinguished by self-willed perspectival constructions and by great sensitivity for atmosphere. The series was reprinted many times by Marieschi s pupil Francesco Albotto, the so-called secondo Marieschi , who was only rediscovered in 1972. Albotto s imitations of his masters work have created a good deal of confusion between the oeuvres of the two artists. Ultimately, however, Albotto s style began to ossify and he started to repeat himself, making it less difficult to separate his work from that of Marieschi. 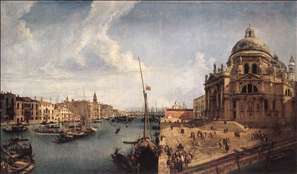 See more details about "View of the Rio di Cannareggio"
See more details about "The Grand Canal with the Fishmarket"
See more details about "The Grand Canal with the Fishmarket "
See more details about "The Grand Canal at San Geremia"
See more details about "View of the Basilica della Salute "
See more details about "The Grand Canal at San Geremia "
See more details about "The Rialto Bridge from the Riva del Vin"
See more details about "The Rialto Bridge in Venice "
See more details about "The Grand Canal near the Salute"
See more details about "Imaginative View with Obelisk"